Adopted on April 03, 1948 . 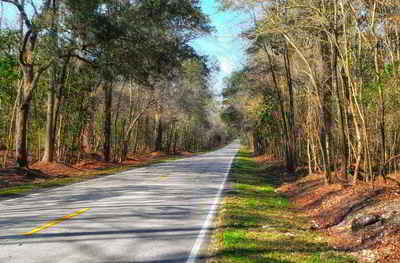 Though the sabal palmetto is its most important symbol, South Carolina also holds birds in great esteem. Writing in Nature Magazine in 1932, state bird proponent Katherine Tippetts reported that the Carolina wren, (Thryothorus ludovicianus,) beat out the Carolina dove (eastern mourning dove) in a state bird campaign in 1930. 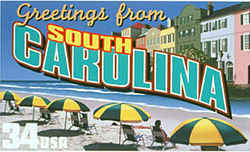 The effort was led by Miss Claudia Phelps, of South Carolina's State Federation of Women's Clubs. Prior to 1939 "The Carolina Wren" had been unofficially recognized as the State Bird of S. C. In 1939 the General Assembly passed an Act (No. 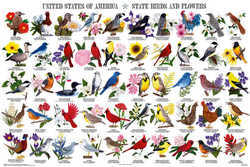 311) designating the Mockingbird as the official Bird of the State. Act No. 693, 1948 (1962 Civil Code, Sec. 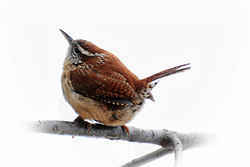 28-2) was passed repealing the 1939 Act and designating the Carolina Wren as the official State Bird instead of the Mockingbird. 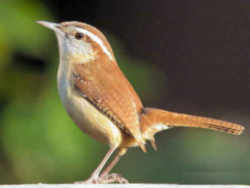 The Carolina Wren is slightly smaller than an English Sparrow and has a conspicuous white stripe over the eyes. The back of its body is rufous-red with underparts somewhat lighter in color. The tail, which is finely barred with black, is held erect when the bird is excited. Carolina wrens (Thryothorus ludovicianus) are small but very vocal animals. Males are especially outgoing and are the only ones to produce songs. 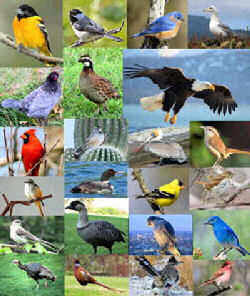 They employ one of the loudest songs per volume of birds. They are apt to sing anytime and anyplace they happen to be. The song; which may be interpreted as tea-ket-tle, tea-ket-tle, tea-ket-tle, tea-ket-tle; may be heard the year-round, day and night, in all kinds of weather. The law designating the Carolina wren as the official South Carolina state bird is Section 1-1-630 (Official State bird) of the South Carolina Code of Laws, Title 1 (Administration of the Government) Chapter 1 (GENERAL PROVISIONS) Article 9 (STATE EMBLEMS, PLEDGE TO STATE FLAG, OFFICIAL OBSERVANCES) Section 1-1-630. Title 1 - Administration of the Government. ARTICLE 9. STATE EMBLEMS, PLEDGE TO STATE FLAG, OFFICIAL OBSERVANCES.